Boomerang is a fun little program mostly for humour which will grab something you type in English, translate it to a foreign language and then back to English while displaying potentially humourous results. Boomerang can translate blocks of text (such as news headlines or quotes) and generally give you and your buddies a fun time reading what Google comes up with. Overall, the usage might be useful if you're bored, but can also be used as a way to translate English-language text into something simply synonymous. Version 1.10.01 is a freeware program which does not have restrictions and it's free so it doesn't cost anything. 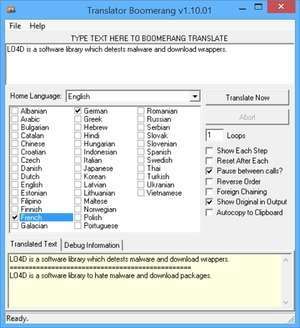 For security reasons, you should also check out the Boomerang Translator download at LO4D.com which includes virus and malware tests. Additional screenshots of this application download may be available, too. Boomerang (powered by Google Translator) has a presence on social networks. Boomerang (powered by Google Translator) download been highly rated by our users.